I wrapped the SFXR from Dr.Petter now. This file features a quick port of the famous "SFXR" program by DrPetter. I&#39;m not streaming the data to the sound card, but rather write a temp file and read that. to generate a .wav file that you later on can read with LOADSOUND. I've put together some code to open .sfs files that have been saved from SFXR, but I've no idea how to implement a save/load function with the GUI at the moment. So here's the loading code, maybe someone wants to tidy it up and integrate it. I've implemented a Load SFS button that gives you a file dialog to open an SFS file. There's no error checking, so if you open something that isn't a valid file, I'm guessing it will all go horribly wrong! Next step is to add saving of SFS and a dialog for saving WAV files. However I'm supposed to be 'working' so I don't know if I'll get a chance to do that during the day. If not, I'll carry on with it this evening. next think i'd like to see added is able to use a function call in progam to to play the sound from inside setting the varuables to generate the soiund live.. as opposed to reading in .wav etc..
Today I started designing a gui that i think is worthy for sfxr, but i see that there is already a ddgui one. Do you guys think I should finish this one ? Ketil - Looks very C64'ish, and that's a good thing I'd also love the ability to play sounds without having to create the WAV file first, but I guess that'll mean some upgrades to GLB in order to create sound files in memory rather than having to read them from disk. You'd also need a way of freeing that memory block afterwards, otherwise you could rapidly use up vast amounts of RAM. Guess that's no different from the current setup where you read the WAV files in though. But with playing from RAM, you could have DATA statements for each sound effect, removing the need to distribute WAV files. I know. But playing from RAM is very complicated, especially on iPhone platform. I'll see if I can find a way, though. The C64 interface looks very nice. New update will have PLATFORMINFO$("TEMP") for the temp directory at least. It doesn't have to be an either/or situation. The current system of loading WAV files can remain, you just have an extra set of commands available for creating them direct in RAM. If it created a handle in the same way that loading a WAV does, then the play back code doesn't need to change either. It is actually made from the original C64 charset, and the sfxr is IFLI font from a demo we made in 1991 (http://noname.c64.org/csdb/release/download.php?id=38642). I am also thinking about adding a box for note-values so it's possible to tune (at least the start of ) the FX to the same note/key/scale as the background music. I think that will sound better. If you ported the code for Coin/pickup/Explosion and such, please GIMME! No. I have not ported that code, but I'll look into it. 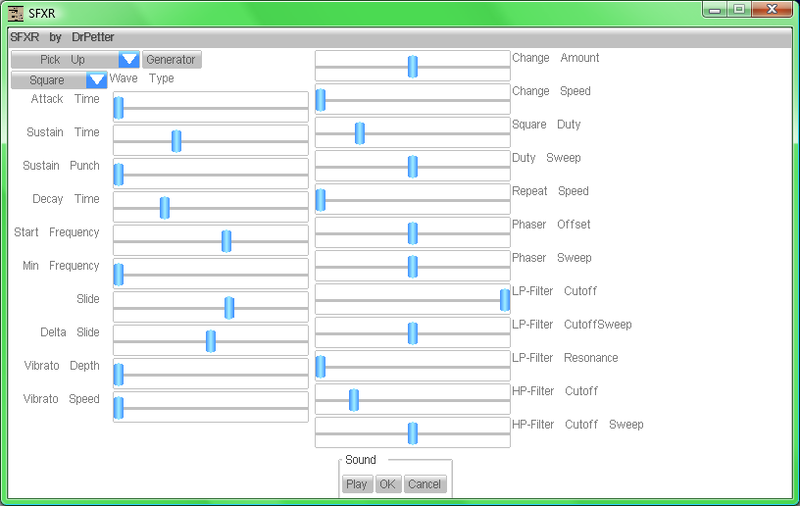 By a quick look at the original gui, I think the "generator concept" is just locking of some parameters while others are randomized within a predefined range. This could easily be done without touching the synth-code.